The concept : Share a good bottle with friends and save the last glass for keeping on paper the souvenir of this great moment. The wine painting made its first appearance in the eighteenth century. 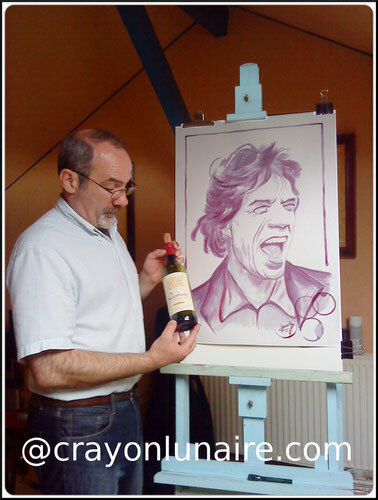 We are currently only a handful of artists in France and over the world to paint professionally with wine due to technical difficulties that wine imposes. Unlike watercolor, painting with wine does not allow editing. I use it pure for painting the clear areas and more or less reduced by evaporation to mark the darker zones. This work is absolutely crucial and may require 5-7 applications. It depends of the origin of the wine that I use to paint with. After a few days in contact with air, the wine begins its oxidation process to turn into its final color ( the color range goes from brown to grey ) At this stage, I apply a protective varnish to guarantee to each painting a perfect preservation in time. Beyond the clichés : What better than a wine painting to transmit to the paper a vineyard morning light mist or the sharp edge of a rocky path. Each wine tells its own story built around a local terroir, a specific grape or a secret winemaking. To every man his terroir and wine! For me it will be a moon grape pressed on a carpet of stars. Caution: I don't own the rights of the stars portraits that I paint. They are not for sale. They take part of my personal collection. 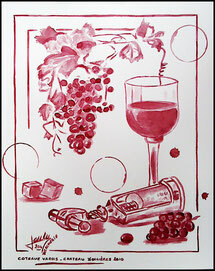 Click on the image below to enter the wine painting gallery.